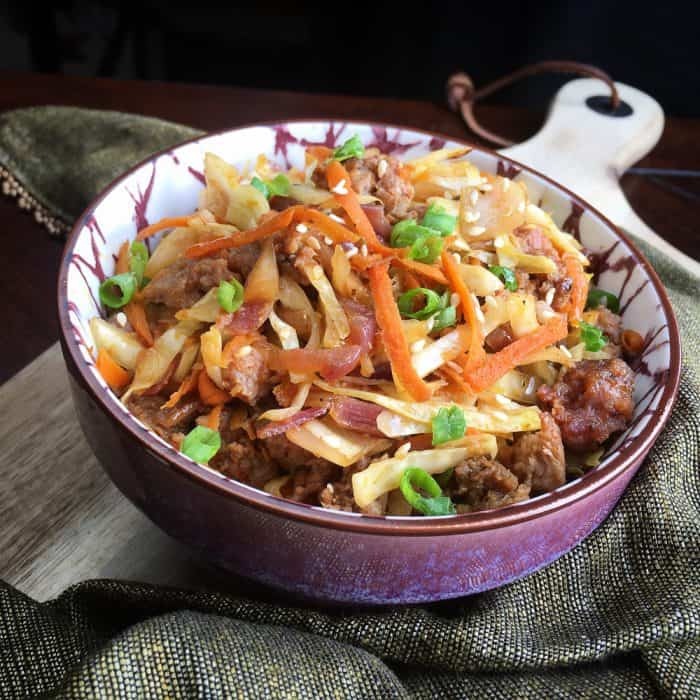 Keto dieters, enjoy your egg roll without the carbs with this sausage egg roll in a bowl recipe. High in fat and low in carbs, it’s a great way to hit your macros and incorporate some veggies into your keto diet and mix up your flavor palate a little bit. If you’re a fan of sesame oil, you will love this sausage egg roll in a bowl recipe. Return skillet to heat. Add water and scrape up brown bits from the bottom of the pan with a spatula. Reduce heat to medium and add shredded cabbage, carrots, garlic powder, sesame oil, ginger, and green onions. Season with salt and black pepper, to taste, and cook, stirring frequently, until the cabbage wilts and the carrot softens, approximately 4-5 minutes. If you have leftover meat from this sausage egg roll in a bowl recipe, you might like to use it in this keto instant pot sausage soup recipe! Check out this family Southern fried cabbage recipe too which was keto before it was cool.